WELCOME HOME! 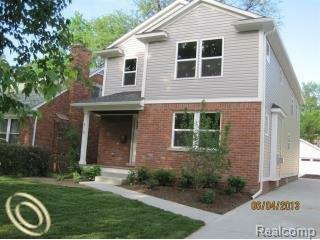 THIS COMPLETE REMODEL IS 2350 SQ FT WITH 4 BEDROOMS, 2.5 BATHS. AN INCREDIBLE OPEN FLOOR PLAN THAT IS JUST WAITING TO BE ENTERTAINED IN. A MASTER SUITE WITH A HUGE WIC. BEAUTIFUL TILE THROUGHOUT KITCHEN & BATHS. SS APPLIANCE PACKAGE INCLUDED. HARDWOOD ON FIRST FLOOR, CONVENIENT 1ST FLOOR LAUNDRY AND EVERYTHING ELSE YOU HAVE COME TO EXPECT WHEN BUYING YOUR DREAM HOME. ENJOY DOWNTOWN ROYAL OAK AT IT'S BEST. Weyrick & Wilson Sub is a subdivision within the city of Royal Oak, Michigan. There are currently 1 Homes for Sale within Weyrick & Wilson Sub, with asking prices ranging from $279,900 to $279,900. The average list price per square foot of the available inventory in Weyrick & Wilson Sub is $277, which is above the Royal Oak average of $210. The Average Sales price of all sold real estate in this subdivision for the past year is $280,583. Recent comparable homes have been selling for 98.45% of their asking price. Waterfront homes represent 0.00% of the available Weyrick & Wilson Sub inventory. The population of Royal Oak, according to the 2010 Census, is 57,236. The total number of households in the zip code of Weyrick & Wilson Sub is 12,146, with an average household size for of 2.00 people. The total number of renter households within the zip code of 48067 is 4,193, which means that 65.48% of households in this zipcode are owner occupant households. 315 S Vermont Avenue , Royal Oak MI 48067 is a Home, with 4 bedrooms which is recently sold, it has 2,346 sqft, 0 sized lot, and 2 Car parking. A comparable Home, has 2 bedrooms and 2 baths, it was built in and is located at 203 S VERMONT Avenue Royal Oak Michigan 48067 and for sale by its owner at $ 279,900. This home is located in the city of Royal Oak , in zip code 48067, this Oakland County Home, it is in the WEYRICK & WILSON SUB Subdivision, and ROYAL OAK MANOR are nearby neighborhoods.